Chipman residents mourning the death of two men are frustrated that little was done to address complaints about a known problem household, where the accused killer lived with his girlfriend. Chipman residents mourning two men shot to death are frustrated that little was done to address complaints about a known problem household, where the accused killer lived with his girlfriend. Terry Sutton, 39, and Jason Williams, 40, were killed on the doorstep of a house at 47th Avenue and 49th Street Sunday. Raymond Nickerson, 36, is charged with two counts of second-degree murder in their deaths. Erich and Rose Frobel showed up in Fort Saskatchewan court Thursday as Nickerson was scheduled to make his first court appearance. "We need to make sure that they know — the families of the ones that got killed know, we're standing with them," Rose Frobel said outside court. Frobel and her husband live near Nickerson in Chipman, 70 kilometres east of Edmonton. They were also in court because they've had their own issues with Nickerson. "That man has shot my house up, my fence up. I have no use for this man," Erich Frobel said. The Frobels showed CBC News the bullet holes in their house. Other neighbours have complained about loud parties and ATVs being driven late at night, said Chipman mayor Jim Palmer. 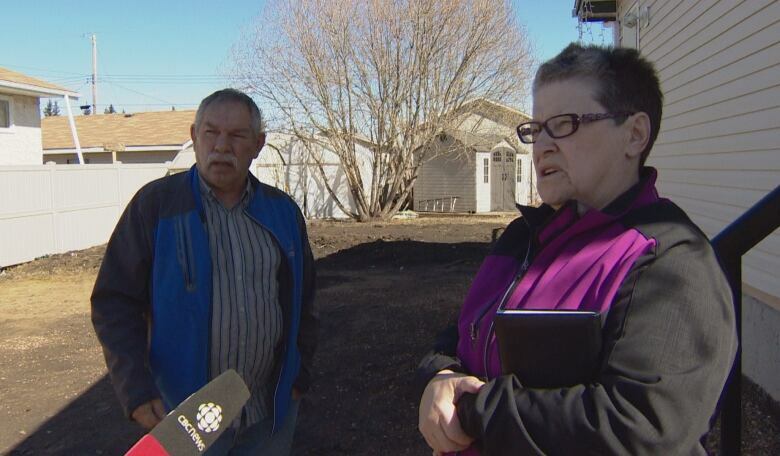 Palmer, who's been mayor for 25 years, said he was shocked at the news but said it's no secret there have been problems from the Nickerson home for at least three years, he told CBC News by phone from Arizona Thursday. 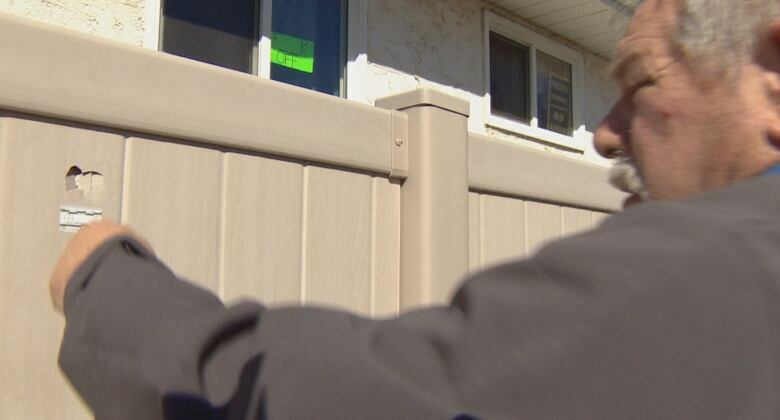 "The RCMP are very aware of the issues that were at that house. I don't know if they chose to do nothing or they couldn't do nothing, I don't know," Palmer said. "I don't know how it unfolded. All I know is two people are dead and there could have been more." RCMP would not comment on allegations against the Nickerson household. "We won't speak to ... the specifics of any of those people involved and how many calls to service we may have had, because that's a bit of a privacy issue for all the people involved," RCMP Cpl. Laurel Scott said. Rose Frobel has kept a journal of run-ins she and her husband have had with Nickerson and his spouse. She said they called RCMP several times and had given them a copy of her notes. 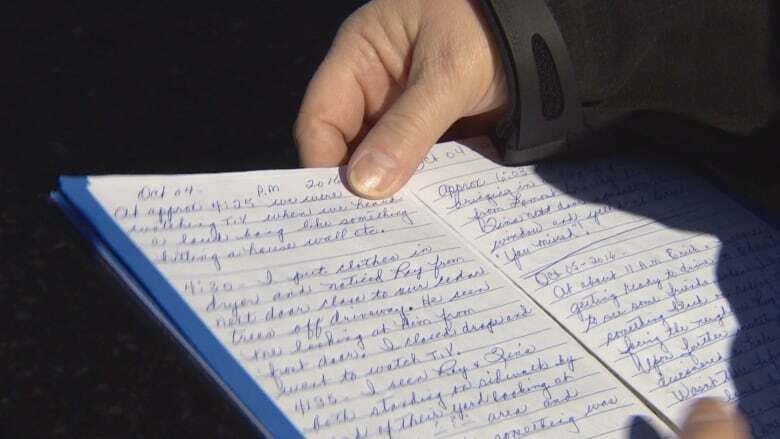 "They've got this whole thing here," Frobel said patting her journal. "This is about just what we've been going through, what the neighbourhood has been going through … hell." 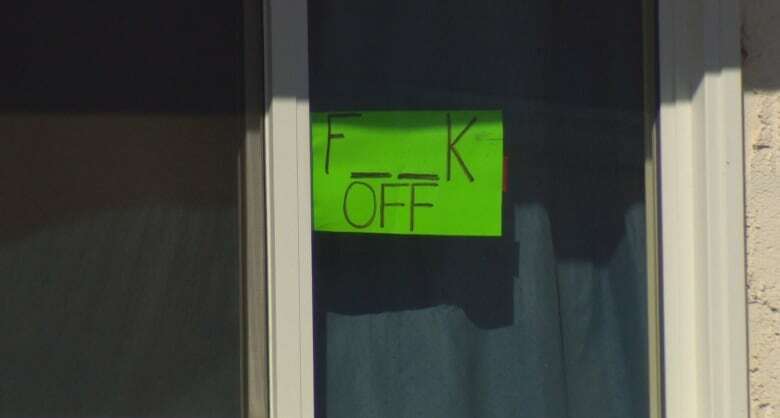 The house displayed profane and threatening signs warning people to stay away. "He should have been locked up before this," Erich Frobel said. "I want to see that justice is done," Rose Frobel said. "We have asked how many times. We've gone to the police, we've gone to the village council." Sutton and Williams were friends, who worked for Ketek Group, a service and materials supplier for oilfield projects. In court Thursday, Nickerson was told he's not allowed to contact several people in Chipman, including the Frobels. His case has been adjourned until April 20.